Nebulae are huge interstellar clouds of gas and dust that range in size from 1 AU to 10 AU, and which are less dense than the deepest vacuum in Earth's laboratories. Just one portion of of a nebula the size of Earth would weigh only a few kilograms! The first nebulae that formed after the Big Bang contained mainly hydrogen and helium, but later nebulae formed with nitrogen, carbon, oxygen and even large molecules. The size, shape and characteristics of nebulae may vary significantly because some are star nurseries and others are the remains of dead stars. 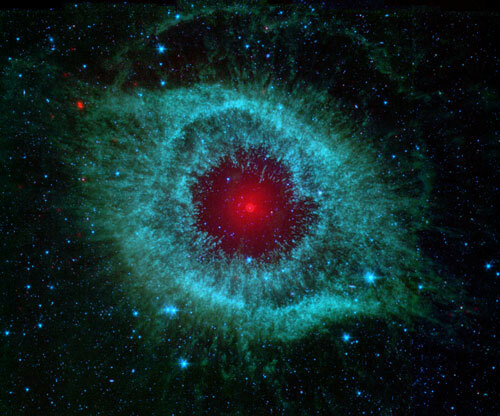 Keep reading to learn more about dark nebulae, emission nebulae, reflection nebulae and planetary nebulae. Dark nebulae are found in areas that have no nearby stars. They neither emit nor reflect enough light to be visible. In fact, dust particles usually blot out light from the stars behind them, though occasionally bright stars behind the dark nebulae will emit enough light so we can see the outlines of a dark nebula. Surprisingly, scientists discovered that besides the common elements like hydrogen and helium, these clouds contain some simple molecules like water, methanol, carbon dioxide, and ammonia. These molecules can stick together and form grains, which probably play an important role in the formation of the stars. 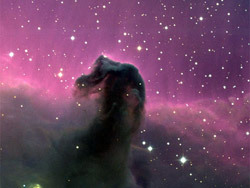 The Horsehead Nebula, one of the most famous dark nebulae, is located in the constellation Orion. Emission nebulae are huge bright gas clouds with irregular shapes and dimensions that span many light years across. 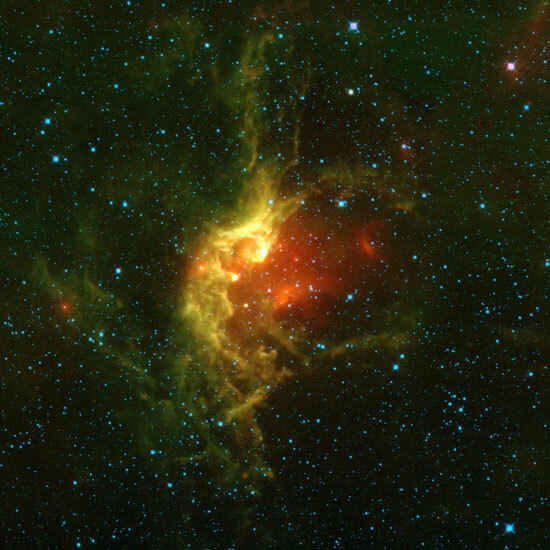 Emission nebulae are where stars are born. When stars begin to shine, they heat up the remaining gas around them and that gas starts to shine as well. One of the most famous emission nebula is M42, which is located in the constellation Orion. With binoculars you can see it as a pale diffuse spot that appears to be shaped like a heart. 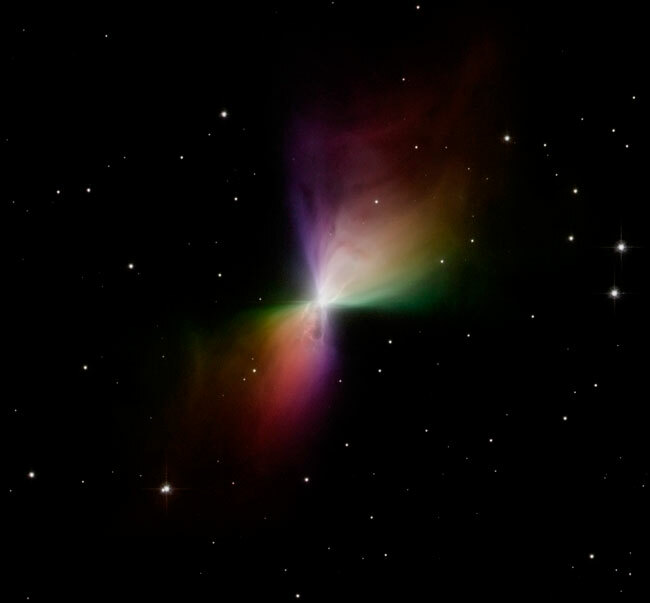 With powerful telescopes astronomers are able to detect many young stars inside. Reflection nebulae are usually faint and shine with the reflected light of the stars within them. They are the remains from the former dense cloud of an emission nebula. Once stars are born inside an emissions nebula, they consume large amounts of the nebula's dust and gas, and the remains continue to shine with a faint reflected bluish light. An example is Pleiades in the Taurus constellation. Its stars formed about 10 millions years ago, yet it continues to shine with a bluish light. Planetary nebulae are the remains of stars. When a middle size star, like our Sun, ends its phase as red giant, it expels its outer shells. 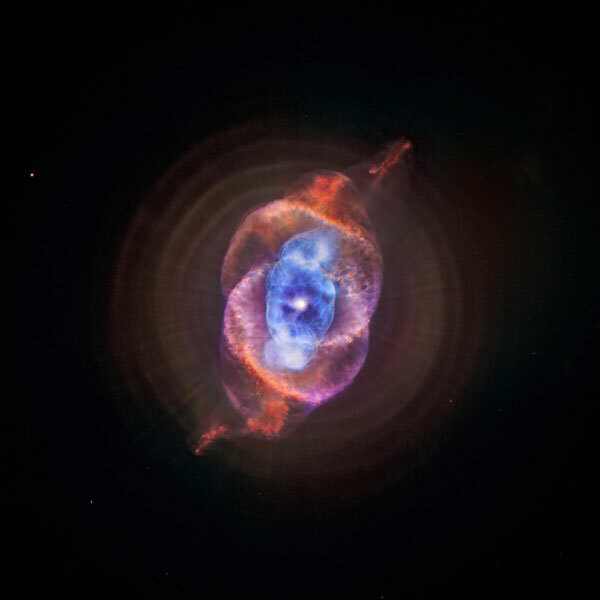 These outer shells form beautiful nebulae with a regular symmetrical shape. Planetary nebulae tend to be smaller; they rarely exceed more than few light years across. With binoculars, you can easily find Planetary Nebula M57 in the constellation Lyra, and it will look like a pale spot. Photographs with larger telescopes clearly show its ring shape. Stars are usually born in groups in dark dense nebulae sometimes called star nurseries. It is not quite clear what exactly triggers star formations. It might be the distribution caused by explosion of a nearby star or simply the gravitational pull of the gas condensation within the nebulae. Once formed, these gas condensations start to grow, attracting more and more gas and dust. Astronomers called them EGGs - Evaporating Gaseous Globules. They look like fingertips emerging from a gas cloud. After some time, they split from the cloud, condense and heat up. Since they swirl at the same time, the gas around them starts to form a disk around the future star. When the temperature in the star becomes high enough for nuclear fusion to begin, a star is born. The star's wind then expels the gas remnants and the star begins to shine steadily. Dark nebulae do not shine with visible light because they are very cold. 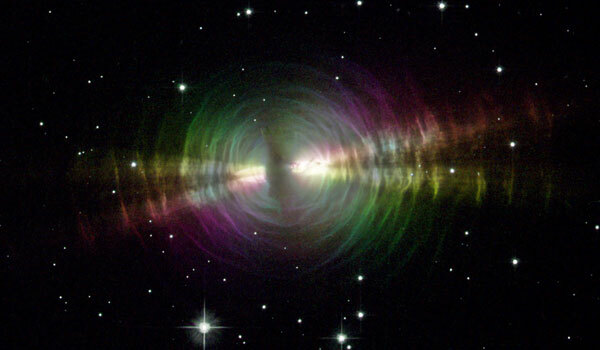 However they emit radio waves with wavelengths of up to 21 cm and this allows astronomers to detect and study them. Using radio telescopes, astronomers detected many dark nebulae in the disk of our galaxy and especially at its center. 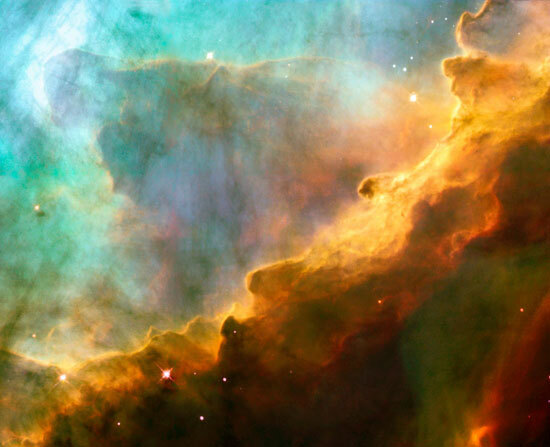 The Hubble Space telescope has taken wonderful pictures of all kinds of nebulae. It has revealed that some of the newly formed stars are surrounded by disks made from dust and ice. Those images provide evidence that planetary systems might form at the same time as the stars. 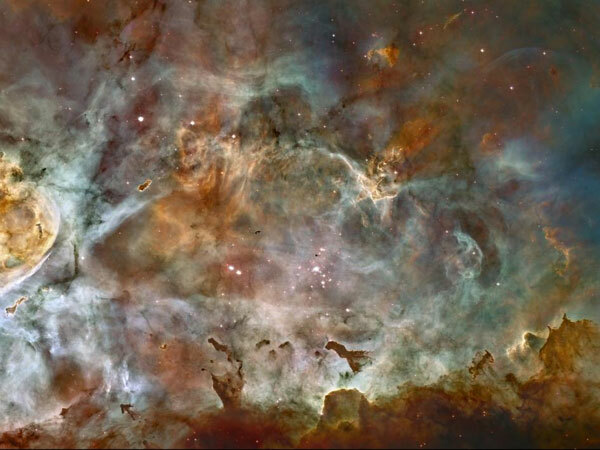 The Spitzer telescope has taken breathtaking pictures of many nebulae at different stages of star formation. Since this telescope can view infrared light emitted by objects much cooler than the stars, it can penetrate deep in the heart of nebulae and find out what happens. 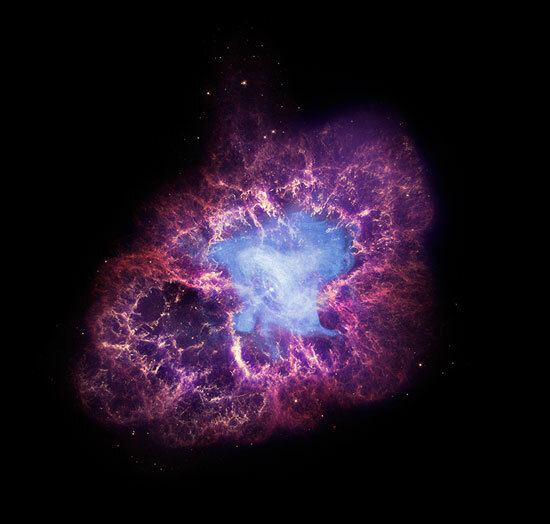 The biggest stars usually end their lives with gigantic explosions called supernovas. They become as bright as the whole galaxy. Remains from these explosions also form bright nebulae with irregular shapes. The heavier chemical elements, necessary for life, also form during these explosions. A unit of measure equal to the distance between the Earth and the Sun, or 149,597,870.7 kilometers (92,955,807.3 miles). The scientific explanation for the origin of the universe, championing the notion that the universe spontaneously originated 15 billion years ago in a colossal explosion. A colorless and odorless gas, and one of the most abundant elements in Earth's atmosphere, and the seventh most abundant element in the Universe. Nitrogen is a byproduct of the fusion process that occurs in stars. The fourth most abundant element in the universe, carbon is the basis for life on Earth. The third most abundant element in the universe and a key component of the air we breathe. A colorless, flamable liquid, commonly used as antifreeze. A colorless gas consisting of one carbon atom bound to two oxygen atoms. A dark nebula in the constellation Orion. One of the most well-known constellations in the sky, Orion is home to the stars Betelgeuse and Rigel, as well as M42 -- the Orion Nebula. 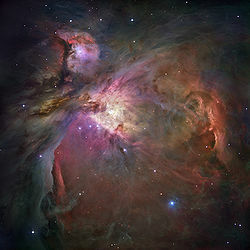 Messier 42, also known as the Orion nebula, is a nebula located just south or Orion's belt, seen as on of the points of light in Orion's sword. An open star cluster located in the constellation Taurus, containing hundreds of stars. The seven brightest, Sterope, Merope, Electra, Maia, Taygeta, Celaeno, and Alcyone, are named after the Seven Sisters of Greek Mythology. One of the constellations of the zodiac, and home to the red giant star, Aldebaran. Messier 57, more popularly known as the Ring Nebula, is a planetary nebula located in the constellation Lyra, south of Vega, Lyra's brightest star. A constellation visible in the northern hemisphere and home to the stars Vega and Sheliak. Nuclear fusion is the process by which the nuclei of two atoms fuse together to form a heavier element; large amounts of energy are produced by this fusion.